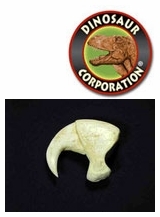 Museum quality claw replicas are cast in durable Polyurethane resins. Made in USA. African Lion front claw, American Badger, American Badger, Black Bear, Bobcat, Canadian Beaver, Cave Bear, Coyote, Eremotherium, Golden Eagle, Grizzly Bear, Mandrill Baboon, Mountain Lion, North American Porcupine, Polar Bear, Polar Bear, Red Fox, Saber tooth Cat, Sloth Bear, Snow Leopard, Snow Leopard, Turtle claw.